Francis Schaeffer has written extensively on art and culture spanning the last 2000 years and here are some posts I have done on this subject before : Francis Schaeffer’s “How should we then live?” Video and outline of episode 10 “Final Choices” , episode 9 “The Age of Personal Peace and Affluence”, episode 8 “The Age of Fragmentation”, episode 7 “The Age of Non-Reason” , episode 6 “The Scientific Age” , episode 5 “The Revolutionary Age” , episode 4 “The Reformation”, episode 3 “The Renaissance”, episode 2 “The Middle Ages,”, and episode 1 “The Roman Age,” . My favorite episodes are number 7 and 8 since they deal with modern art and culture primarily. For me, the ‘Seventies were virtually bookended by Francis Schaeffer. I read The God Who Is There for the first time in 1972 and my intellectual life was transformed. Though I struggled with some of the ideas in the book and at times I wished the author might have given a bit more background material to explain his assessments, I had the overwhelming sense that I had crossed over into a new world. Then in 1978 I spent ten successive Thursday nights going to a church in Ft. Worth, Texas, to view the successive installments of the film series, “How Should We Then Live?” At the time it was a tour de force in Christian film production, and it convinced me that it was possible not only to make a credible case for Christianity, but that it might also be done in an attractive and compelling format. Schaeffer was the first apologist I ever read, and his impact on my thinking was profound. But he is more than that. Hegel reminded us that the Owl of Minerva flies at dusk, and if this is so, then one might surmise that the real jolt of Schaeffer’s work would not be felt until after he was gone. I personally believe this to be the case. As helpful as he was as a teacher to me when I was eighteen years old, now I read him as a prophet. Schaeffer was one of the first evangelical thinkers to take note of rising postmodernity, though that term was not au courant in his time, and to recognize it for what it was, not what it claimed to be. His criticisms of Samuel Beckett and Mondrian, for example, show that though these postmodern cultural icons claim to be critiquing any possibility for objective truth claims, the fact is that they offer their own tacit affirmations about truth. He labored as an evangelist. 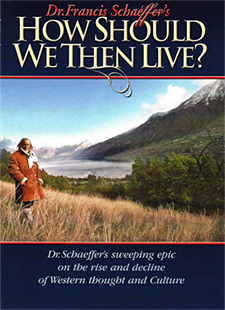 Schaeffer’s work might be seen as the reverse of the strategy exercised by postmodern critics such as Herbert Marcuse and Theodore Adorno in the early ‘Sixties. These members of the Frankfurt School launched a very caustic critique of all claims to knowledge and truth that stood in the heritage of classical antiquity, of the Christian worldview, or even of modernity. However it may seem to the casual reader of books like One-Dimensional Man, though, the goal of these iconoclasts was not the rejection of outmoded forms of discourse so that marginalized speech might finally have its place in cultural life. These men had political ends in view—they wanted to take over the state. In order to do that, of course, they needed to gain a mass following. Knowing that it was highly unlikely that their intellectual concerns would find a sympathetic hearing among either the working class or the bourgeoisie, these left-wing intellectuals turned to university students to obtain a pool of disciples. Marcuse and company knew full well that their stance of negativity toward prevailing institutions and truth claims would find a ready hearing among the disaffected youth of the (mostly) middle class. The result was the student protest movement in places such as Paris, Columbia University, and Berkeley. Second, Schaeffer wanted to tell these young persons who have been steeped in Marcuse, Sartre, and Nietzsche that they do not have to sell their souls to the devil of a fractured metaphysic. The answer to the human condition lies not in nihilism, but in the Infinite-Personal God of biblical revelation. This God seeks a relationship with humans through the death and resurrection of his Son, Jesus Christ. Though the church has often obscured the essence of the faith through its traditions, biblical Christianity understood in terms of the Reformation traditions provides the real solution to the human dilemma. We can know that this message is true both because it rings true in our lives and because it is presented in a Book that is absolutely trustworthy. Again, though my own approach to apologetics may not be completely Schaeferrian any more, his approach helped me work through issues related to presuppositionalism, evidentialism, and the classical approach. Francis Schaeffer the prophet points us the way through the maze of postmodernity. Like other prophets to postmodernity, such as Solzhenitsyn and Alvin Gouldner, he reminds us that the advocates of existentialism and postmodernism are not disinterested, objective observers of the contemporary situation. They rather have adopted a discourse of radical suspicion for the purposes of transforming the moral condition of this world into something more fitting with their own rejection of Judeo-Christian values. Further, in their defense of marginalized discourses, though they appear to be the Robin Hoods of postmodern culture, taking from the bourgeoisie and their intellectual hired guns, in fact, beneath the mask they really are the Sheriff of Nottingham, with political goals of their own. Postmodernity is a power play by humanistic intellectuals for the purposes of intellectuals, and we ought not to be deluded into thinking otherwise. Charles Atlas was born in St. Louis, Missouri, in 1958. Atlas is a filmmaker and video artist who has created numerous works for stage, screen, museum, and television. Atlas is a pioneer in the development of media-dance, a genre in which original performance work is created directly for the camera. Atlas worked as filmmaker-in-residence with the Merce Cunningham Dance Company for ten years. Many of Atlas’s works have been collaborations with choreographers, dancers, and performers, including Yvonne Rainer, Michael Clark, Douglas Dunn, Marina Abramovic, Diamanda Galas, John Kelly, and Leigh Bowery. Television Dance Atlas—the artist’s critically acclaimed prime-time event on Dutch television—was a four-hour montage of original and found footage incorporating dance styles as varied as ballet, burlesque, and figure skating. Atlas also creates video installation works. The Hanged One—a work inspired by symbolism from the Tarot and foot-fetish culture—incorporated numerous video elements as well as rotoscopes, motorized mannequins, and theatrical lighting. Atlas is the recipient of three Bessie (New York Dance and Performance) Awards. His feature-length film Merce Cunningham: A Lifetime of Dance won the Best Documentary Award at Dance Screen 2000 in Monaco. His work has been shown at international institutions, including the Whitney Museum of American Art, New York; the Museum of Modern Art, New York; Musée National d’Art Moderne, Centre Georges Pompidou, Paris; Institute of Contemporary Arts, London; the Museum of Contemporary Art, Los Angeles; and Stedelijk Museum, Amsterdam. Atlas acted as Consulting Director for “Art in the Twenty-First Century” (Seasons 2 through 5), creating the original opening programs for each hour-long segment of Season 2, as well as supervising the “Stories,” “Loss and Desire,” “Memory,” “Play,” “Protest,” and “Paradox” episodes. Charles Atlas lives and works in New York City and Paris.